The Korea JoongAng Daily launched a five-month-long series about the fourth industrial revolution in April, exactly a year after “Fourth Industrial Revolution” by Davos Forum founder Klaus Schwab hit the shelves in Korea. Presidential candidates scrambled to come up with campaign pledges related to the term that hardly anyone - not even the reporters at the paper’s Business Desk - was familiar with. In just five months, many things have changed. The fourth industrial revolution has become one of the most frequently used buzzwords in practically every sector - from corporate to social and political - and the Moon Jae-in administration went so far as to launch on Monday a presidential committee devoted to the idea. Even though questions linger over how best to refer to the ongoing technological advancement, what is certain, according to the panel, is that Korea is in the midst of a period of rapid change, the speed of which is difficult to imagine, and Korea must rush to catch up. The experts also agreed that humans will still be at the center of the technological breakthroughs, propped up by artificial intelligence, and coexistence and collaboration between humans and machines will remain a core value in the future. 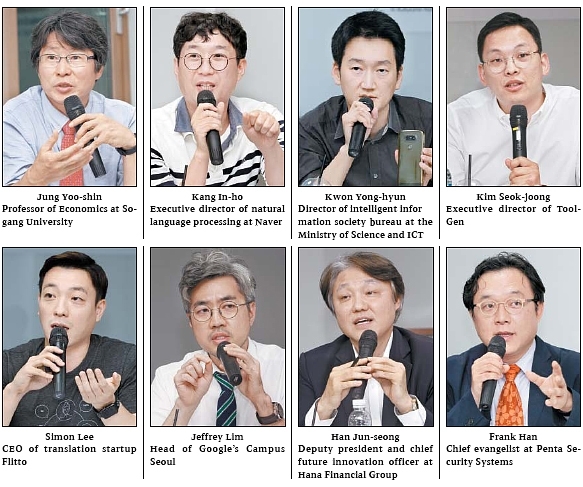 The discussion was mediated by Jung Yoo-shin, professor of economics at Sogang University and the panel, in the order that they were sat, included: Kang In-ho, research engineer at Naver; Kwon Yong-hyun, director of the intelligent information society bureau at the Ministry of Science and ICT; Kim Seok-joong, executive director of ToolGen; Simon Lee, CEO of Flitto; Jeffrey Lim, head of Google’s Campus Seoul; Han Jun-seong, deputy president and chief future innovation officer at Hana Financial Group; and Frank Han, chief evangelist at Penta Security Systems. The event lasted nearly 170 minutes at the Korea JoongAng Daily office in central Seoul. The following are excerpts from the discussion. Jung Yoo-shin: The title of today’s discussion is “The fourth industrial revolution is real.” The word “real” implies that there are events actually happening in the world around us. Candidates for the most recent presidential election talked about it and even today the Blue House appointed members of the presidential Committee on the Fourth Industrial Revolution. But some raise suspicions about whether the term “fourth industrial revolution” is appropriate and others say the third industrial revolution is still going on. I would like to ask your opinion. Jeffery Lim: It’s true that the term fourth industrial revolution seems to be much more talked about in Korea than abroad. Other countries don’t exactly explain the ongoing change with that particular terminology because people have different ideas and definitions about the change that is happening around us, naming it in various ways. But regardless of what it’s called - whether it’s the third or the fourth - there is common ground among these opinions. The first thing is digital transformation. With the rise of big data and the Internet of Things, data is being converted into a form that can be understood and learned by machines. Second is the distribution of technology. Technology and data, as well as business models, were centralized in the past. You needed special capital and resources in order to run a business. Now you can have multiple assets operating at once worldwide without necessarily owning them as we see with Uber and Airbnb. Third is democratization. Tech projects like translation research that requires machine learning were so gigantic in the past that only governments or conglomerates were able to embark on them. But now start-ups and individual programmers have access to open source platforms and task programs. Even gene analysis, which cost several trillions of won in the past, is now available for just a million won ($876). Jung Yoo-shin: What is your opinion as an expert on artificial intelligence? When a new technology was developed in the past it took about six months to a year to analyze and reproduce it, because researchers would exchange feedback on how and to what extent we improved the technology. Nowadays, researchers upload their latest problems to a web archive before presenting it to their peers offline. Programmers would also share codes and verify one another. What we see often are smart people, regardless of their major and degree, jumping to solve the same problem and then sharing the method they used to solve it faster and better than others. For us too, the best model changes per week. It’s now harder to say “This model is the best,” because we see better models coming up every one to two weeks. It’s as if we’re in a race every day in which the No.1 winner is constantly renewed. [As a programmer] I think it is much harder to keep track. For recruiting, we no longer screen by major or degree. The question is rather “Does this person have the basic ability to learn new skills, work with machine learning, code or have enthusiasm?” Employees that enter through this process are much better workers. From our perspective, we feel the change from the hiring process, as well as the remarkable learning speed of our new employees. [In terms of technology development], I don’t think the latest technology will be immediately applied to services or goods [that reach the public], but I feel something is changing. However, it’s hard to say how much of that is the fourth industrial revolution as opposed to the second or third. Jung Yoo-shin: Assuming that the fourth industrial revolution is real, what is the government’s perspective on this and are there any aspects that are specific to Korea? Kwon Yong-hyun: The term fourth industrial revolution was not created in Korea. And after the concept was first introduced, there have been many interpretations of what it means. When Klaus Schwab selected 21 technologies and said the world would change once they are all realized, there were counterarguments saying “All technology is important and significant.” The OECD talks of “digital transformation” with a focus on digital technology. The government has been analyzing [such discussions] but what I can say for sure is that we are indeed in the middle of a huge transformation. Regarding the fourth industrial revolution, or whatever it should be called, there aren’t many countries that are diving into this with profound interest, except a few - the United States, China, Japan and Germany, the fop four economies. These are the only ones that are really struggling to find a way to take the lead after the paradigm shift. Korea is a relatively advanced country when it comes to ICT technology such as data, networking and IT solutions - this is why I believe we are one of the few countries that spots and understands the changes that are coming upon us and tries to come up with ways to cope with it. Last year, technological change was only explained and talked of using technical words. This year, that is changing. In September, American academics in economics and business management gathered to analyze [the concept]. The academics weren’t just university professors, but also Nobel Prize winners. When Schwab first introduced the concept last year I tried to look for other prestigious award-winning academics in economics or business management who talked of a similar phenomenon, only to find that there were none at that time. I have seen some people say that they don’t feel the fourth industrial revolution approaching at all. They say that there is a lot of noise being made about it by only a few people - including the presidential candidates that mentioned the term many times during their campaigns. But whatever we call it, there is a major change approaching us and I can say the government is surely feeling its importance and magnitude. Jung Yoo-shin: The three previous industrial revolutions caused huge changes in the manufacturing sector. But this new shift that we call the fourth industrial revolution encompasses transformations in the services and finance sector as well, which I think is why it is legitimate to title it the “fourth.” Changes in the finance sector are happening unusually fast compared to other industries. Why is this? Han Jun-seong: Senior executives and experts in finance abroad are different to Korea’s finance insiders. The biggest difference is experience. They perceive this rapid change as natural and they make efforts to adjust to it. Korean finance experts, however, are frustrated because none of them have that experience. Luckily, I’ve worked at the forefront of fintech in Korea, so change itself doesn’t fluster me but I do think the recent change is unusually quick. Most of you here would say that finance services today are much more digitalized [in terms of usage and platforms]. But the essence of digital transformation in finance is [client] information. The core question would be: How can we process information in the best way to solve our clients’ problems or inconveniences? Banks have upgraded their database structure many times in order to connect as much information as possible and offer clients better services. However, the problem is that even the most recent database structures are insufficient to cope with the so-called fourth industrial revolution. To make a meaningful change, every IT system of every financial organization in the world should change. We have IT majors right out of college working at our bank and what they say after staying a week is that the database structure seems like it was made in the Joseon Dynasty (1392-1910). KEB Hana Bank alone has to invest trillions of won to change this, so it’s safe to say a radical change in the finance industry is close to impossible. This is why many financial organizations in the world have almost given up on changing their database system. The only way to overcome this crisis is to create an entirely new organization and process. This is where our chance lies. KEB Hana Bank’s annual costs are around 3.3 trillion won - what’s notable is that most of this money is poured into conventional infrastructure like branch operation or the existing network system. This is why banks are closing down branches; because we need to reduce costs to invest in the future. Banks have so many difficult decisions like this to work on. Furthermore, banks have started to fall short of fulfilling clients’ needs. Only five years ago, if a client comes to a bank window, tellers introduce them to new digital services and teach them how to use them. Nowadays, a client would come up first and ask “Why doesn’t your bank offer this service?” In other words, clients know much more about technology than bank tellers. This gap spurred fintech companies. Old major banks can’t really do much to counteract this. All we can do is add more functions, but this is hard too. Banks are not tech companies. What we do is use technology and offer it as a service to clients. We have to upgrade digital infrastructure and many other areas in order to keep up. But we face a real threat because nowadays, tech companies are starting to enter finance. Banks might actually have to worry about starving. On a global perspective, Korea’s financial digital system is almost top tier. And it’s not only us that is struggling - the U.K., U.S. and Japan are all working on the same issue. Jung Yoo-shin: What are your thoughts about Kakao Bank? Han Jun-seong: I am not too afraid of Kakao Bank, personally. Finance is a conservative and deep-rooted industry that’s not easy to tear down. There are various and complex issues involved such as capital. A bank cannot survive in this market with just convenience. As soon as you launch something new, customers want something more convenient. Korean customers want something better just six months after the launch of a new service. I believe Kakao Bank will experience solid growth but it will be difficult to change the dynamics of the entire financial industry. There is a bigger concern we have, namely payment platforms such as Alipay and WeChat Pay in China, as well as Google Wallet and Apple Pay. Korea has little to no experience in this field right now. Also, how do we use all the data that we have available today? What I also fear is that data about the lifestyle of Koreans may leak out to foreign countries. How will we respond to this growing trend and how can we become more competitive in the global market? Kakao Bank will experience robust growth, but it will only be growth in a single field within the entire financial industry. Looking at the industry as a whole, I am more afraid about the threat from the payment services. Jung Yoo-shin: Naver, Kakao’s competitor in portal sites and messenger apps, is renowned for artificial intelligence research. What related strategies do you have? Kang In-ho: I am confident that Naver is second to none when it comes to [artificial intelligence] technology. These days, we focus more on going global [with the technology we have]. We have Clova [an artificial intelligence system from Naver] and while we do want to do well in Korea, we want to test it out in the global market as the system is becoming less retrained by language. We also have the Line platform overseas and we constantly ponder the possibility of taking [Clova] technology to the markets where Line is popular. We do not want to limit how our customers interact [with technology]. Consumers should be able to use more than just written text to communicate with machines, which is why we are trying to further develop imaging technology. Our system should be able to recognize even the motions and actions of customers and natural language processing technology becomes vital as a result. I think our current technology can recognize at least three of the five senses. It’s our goal to eventually create services that allow us to help customers in any situation. Jung Yoo-shin: What about your motion-sensing technology? Kang In-ho: Our target clients span from children to adults and we even want to make a toy robot that can be controlled with motions and gestures. There are different types of people in this world. Some are talkative while some like to communicate with their writing. Others simply want to communicate with motions and movements. Thinking about navigation for instance, a driver may not be able to hear the directions from the navigation system due to the road noise. We wonder if it’s possible to replace this with motions and movements and we are conducting research to answer this question. Jung Yoo-shin: An interesting element of Flitto, a translation app, is that human specialists are involved in translations even though the platform is known to be artificially intelligent. Why? Simon Lee: People have different outlooks about the future due to the emergence [and development] of different technologies such as artificial intelligence. But I also think the potential uses of artificial intelligence in daily life may be a little bit exaggerated. It’s true, however, that different industries, even in the United States, are changing rapidly, whether you call that the fourth industrial revolution or not. Personally, I think a platform operator such as Kakao will be leading the changes in the future. They will be able to accumulate an immense amount of data and will release services utilizing this data as well as new technologies. When you carry a smartphone, it collects so much different information about the user constantly and companies will provide services based on that information. This shows how crucial it is to accumulate data, but it’s difficult to collect it relying entirely on artificial intelligence. While we are on the subject of data, people ask me about my outlook on the future of Korea and I have to say it’s quite gloomy. I am pessimistic about Korea’s future because it’s difficult to collect sufficient data in Korea. Korean is considered a minority language globally and we have a small population. Companies may collect data such as spending patterns of Koreans but can we really consider this big data? I think it’s impossible to do big data analysis in Korea. At the end of the day, companies that can actually do big data analysis will be companies from countries where English is the first language. For how long will Kakao and Line compete with just each other? The number of Koreans using China’s WeChat messenger app is on the rise because they can communicate with people from other countries more easily that way. The same analysis can be made about Facebook. Even Koreans are turning to global platforms and the data accumulated through them will end up in the hands of foreign companies. They can create more sophisticated data as well as services and technology. Some companies are often reluctant to admit that they need data to improve the quality of their technologies. For instance, we might sell the data we’ve accumulated to big companies and we would want to publish news to promote the fact. But if we decide to do that, the company would ask us not to let anyone know. This way, they make it seem as if they are not out there collecting people’s data. But to create artificial intelligence requires data collection and any company out there doing research on artificial intelligence are trying to compile more data. I also believe it’s unnecessary to get too hyped up about artificial intelligence. Artificial intelligence systems also need data that they can learn from and only humans can collect and analyze this data. That said, from our point of view, human translators will never become obsolete. For instance, a company may try to enter the Mongolian market if translation apps can help them with the language barrier. But they would realize that for more in-depth and sophisticated translation, they need human translators. In the end, human translators and machines will co-exist with humans getting help from artificial intelligence and vice versa. Jung Yoo-shin: Many people talk about the winner-takes-all dynamic in the market. Do you believe that structure will continue or will smaller platforms be able to survive? Simon Lee: Bigger platforms will survive in the end. Many different platforms will emerge, along with companies that make their money by operating them. Jung Yoo-shin: What kind of relevance does the fourth industrial revolution have on ToolGen’s genome editing technology and how will it influence society? Kim Seok-joong: The biomedical field receives help from artificial intelligence and big data analysis. Think about it. Just 30 years ago, it took 15 years and a lot of money to obtain a single person’s genome data. Now, it takes only one day to obtain one person’s genome data at a cost of $600. The innovation took place swiftly. This is also a field which a lot of countries are investing in as a nationwide project. The U.K., for example, which has a similar health insurance program to ours, believes that accumulating and analyzing the genomic data of the population could end up helping lower the overall cost of the health care system. Under that premise, they are aiming to obtain and analyze hundreds of thousands of people’s DNA information. Data from a single genome, if digitized, generates around one gigabyte of information. With this massive amount of information, big data analysis is required and it becomes important to extract meaningful data from it. From the perspective of ordinary people, changes in the biomedical field will be more obvious in diagnostic applications. For example, we can read a baby’s genetic data, even before they are born, by analyzing small DNA fragments in the mother’s blood. We can predict whether the baby has a higher or lower tendency of getting cancer. It is also possible to use genetic information in trivial but entertaining ways. For example, if a person sends his or her spit in a small bottle, companies can analyze it to find detailed information about their ancestors. It would be more useful in western countries where many ethnicities are mixed. There are even services recommending different wines based on genome information. ToolGen’s core technology is genome editing. People can now obtain and analyze certain aspects of a person’s health information through their gene data. For example, through the analysis, a person could be diagnosed with a higher tendency of getting diabetes. In a way, however, it is like astrology or horoscopes based on constellations. And you can’t do anything more with it. You caution them, but it is in a very passive way. You just have to live with a high possibility of getting diabetes and it can limit people’s lives. Genome editing aims for a world where people are not bound by the genome information they are born with. There is still a long way to go, but the field is moving forward and speeding up. Current genome editing technology uses tools that cut into a genome in a programmed way to make the process highly efficient and precise. With the development of CRISPR/Cas9 system, a current platform for the procedure, genome editing is now being applied quickly in a number of industries including therapeutics and agriculture. However, for genome editing to thrive in various valuable fields, industrial and social infrastructure is very important. I wonder if Korea has the environment for innovative biomedical technology like genome editing. It is because of our lack of experience in advanced gene and cell therapies and biotech crops. Also, social awareness about gene editing and a lot of other biotechnologies are still negative. It will be a pity, even with the success in the development of innovative biotechnologies, if we fail to lead the implementation and industrialization step. Jung Yoo-shin: Non face-to-face transactions are becoming more common in the financial sector. What do you think about security in these cases? Frank Han: Cybersecurity has been around for 30 years since the first PC was born. And its importance grew when the internet came about. Currently, the cybersecurity industry is worth about $100 billion worldwide. Economically large countries are trying to downsize the industry, meaning they are trying to reduce the losses. In the past, cybersecurity was only about personal data breaches and stopping ransomware from getting in one’s computer. But in the face of the fourth industrial revolution era, it became more about people’s lives and disasters. It is no longer about reducing costs [in case of hacking], but about preventing it from ever happening. Now, a lot of home appliances and vehicles come with their own cybersecurity systems. In the era where the Internet of Things has become common, everything can be hacked. During the past 20 years, companies chased hackers after their PCs got a virus and fixed it. But now it is more about taking pre-emptive measures. It became security first, internet connection later. Jung Yoo-shin: Products having to be released with their own cybersecurity systems sounds like a good idea. But it will come with additional costs. Will there be a demand? Frank Han: We are legalizing critical factors that are directly related to people’s lives. Companies can launch products only if they follow the minimum guidelines. Additional elements have to be voluntarily added by the manufacturers. Security companies are doing things on their own but manufacturing companies are hiring hackers or engineers that can find weak points in the products that can be hacked before ever launching them. Manufacturers collaborating with security firms are becoming more common. Jung Yoo-shin: What are the guidelines for individual users to prevent hacking? Frank Han: Except for changing their passwords often, there isn’t much they can do. We say innate security systems are important because consumers don’t have to worry about cyber hacking anymore. Jung Yoo-shin: How are things going with security in finance? Han Jun-seong: If you read the 10 commandments of financial cybersecurity, you won’t even dare to get involved with electronic finance. It is all about cautioning consumers and telling them what kind of things they should not do to prevent hacking. But unfortunately a lot of personal information leaks actually resulted from consumers’ trivial mistakes. Also, financial companies cannot be free from North Korean hackers. The latest ransomware and DDoS attacks were all from North Korea. Cybersecurity in finance in Korea is extremely complicated and tight for the consumers whereas in the U.S. or Europe, the regulations are looser. If an accident happens, the responsibility is on the banks. Jung Yoo-shin: What is the government doing to assure cybersecurity? Kwon Yong-hyun: Cybersecurity is not merely about a single industry. It is about a platform, and many other mixed factors. Based on my experience here, I see how other countries resolve the issue. The United States, for example, takes one or two years to legislate a new law. But they eventually solve the issue. Some other countries just keep talking about the issue, but they don’t end up resolving it. Korea is closer to the latter. For example, the introduction of Uber in Korea hasn’t moved forward since the company launched here. The company is trapped in a conflict with taxi drivers. In the United States, for example, legislation was changed hastily to allow the service. It wasn’t about changing the law one by one when an issue arises, but the government created an entire new law for them. In Korea, there is no such thing. It is important to have a forum like this to talk and listen to detailed perspectives from diverse industries. Jeffrey Lim: I want to say something as well. The fourth industrial revolution is not about technology but it is about life and awareness. It is more of a philosophical issue. Kim from ToolGen made a crucial point that what is more important than creating tools is how we are going to use them. Society is changing fast. In the past, factory workers stood next to the assembly line and assembled auto parts one by one but now machines have replaced them. Artificial intelligence has penetrated into the financial industry as well. How are we going to cope with all these rapid changes and new technology? Lee from Flitto said people and machines have to collaborate and it is true. The world champion team in board game chess is a team comprising of a human and a machine. Humans are nature and machines prioritize efficiency. The issue of equality also arises. Wealthy people can buy a cure for genetic diseases, but not those with a lower income. This trend accelerates with the adoption of artificial intelligence. We have to think about how we are going to come up with technologies that can be equally used by all. If that is not solved, society will get ever more unequal. Audience member: I want to ask a question from the perspective of an employee. I am associated with the IT industry. I do data analysis using machine learning. In the past, some 100 people would do a certain data analysis job, but the number shrank to 20. If we were to only use the so-called “experts,” only five of these experts are needed to do the same job with the help of an algorithm created based on machine learning. Is there anything else, other than being a master of machine learning, which I should acquire in order to stay in this industry? Han Jun-seong: The employment issue is serious in the finance industry as well. There were a lot of employees for transactions in the past, but there aren’t many anymore. I read headlines that banks are downsizing their branches. I think it is time that companies set up their own ideas about education. For example, if banks are suffering, they can educate certain staff members to be experts in small-and-midsize companies. There aren’t enough employees who have expertise in SME’s finances. This way, the SME industry could be vitalized as well. If decision makers can pull off certain collaborations, I think there is much more room to resolve the employment issue. Jeffrey Lim: We should not make a separate solution for white collar or blue collar workers. There shouldn’t be distinction between technicians and scholars. We have to discuss this in a comprehensive way to encompass all types of job, gender and age. Say, how does the United States and Korea perceive the fourth industrial revolution differently? The biggest difference that I personally feel is that the United States had more than 100 years of history at Silicon Valley. They’ve been through certain changes and paradigm shifts. Korea doesn’t have that history. We only perceive things with products and technology. So, all in all, this is a social issue and an issue for mankind. We have to understand this revolution from this perspective as well. The most important thing is that there are no women included in this panel. Can we really pull off a meaningful discussion with only male members? If I have a goal for the next three years, it would be having half of this panel as females. The series, titled “Korea and the fourth industrial revolution,” kicked off on April 25 with three full-page articles about the history of industrial revolutions, a survey of 1,000 adults aged between 20 and 59 and an exclusive interview with Klaus Schwab, founder and CEO of the World Economic Forum and author of the blockbuster best seller “The Fourth Industrial Revolution.” Ever since, the paper has published articles once a week on a range of topics until Sept. 18. Topics covered included: health, cars, smart cities, education, finance, shopping, beauty, translation, legal tech, entertainment, smart factories, energy, smart logistics, food tech, smart farms, disaster management and security.